Would you like to experience real multitasking capability? 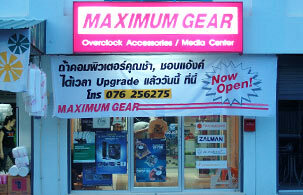 Visit MAXIMUM GEAR to fully enhance your computer performance today! We are the first Mod Shop in Phuket with a goal of providing the best computer case and computer cooling accessories available. We have high quality accessories from all brands, as your one stop shop for all your PC accessories, spares and repairs. We also build media center computers using genuine Microsoft media center software with remote control and wireless keyboards. Our policy is to provide you with the latest custom products and accessories for your computer, at low prices.